It's hard to believe another year is just about over. On a personal level, 2014 was a difficult one. As will be apparent from the lack of posts to choose from this past summer, there were a few months where this blog took a back seat to some difficulties we had to endure. However, when I look back though all these posts, I'm happy to say it was still another great year of recipes! I'm always amazed when I think that I'm able to create all these wonderful dishes right in my kitchen. As always, I'm thankful to all my readers who make blogging worth while - I love all of your comments, kind words, and support. I'm looking forward to another great food year in 2015 (and hopefully a wonderful year all-around). I've been thinking about something that I want to get better at making and that answer is PIE. So, I've decided that I'll be making and posting 25 Pies in 2015! Look for the first one to come in January. Now here are my favorite recipes from each month of 2014, followed by my husband's (aka the official taste-testers) favorites. Some month's are so difficult to pick just one, but I've done my best. Saag Paneer (with Homemade Paneer): This recipe was such a fulfilling one all around - plus it's really two recipes in one! First you have a recipe for the whole dish, but there's also a step-by-step recipe for making your own Paneer. If you haven't tried this yet, please do. Not only is is so delicious and flavorful, but it's really rewarding (and easy) to make the homemade cheese! 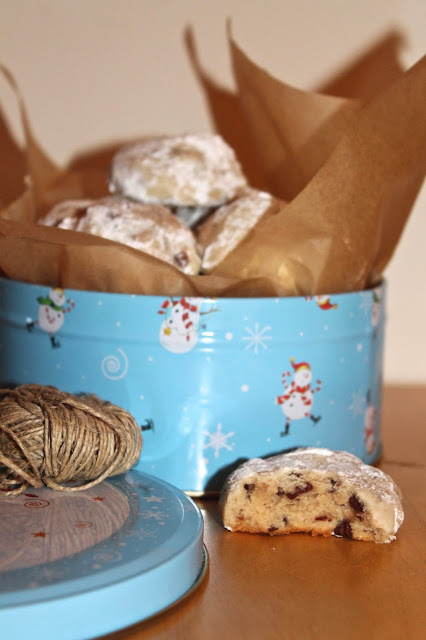 One last December cookie recipe and then it's time to make other things in my kitchen again... Just kidding, I'm still making a lot of other stuff, it's just that at this time of the year, there are so many cookies, sweets, and other goodies to make, enjoy, and share! 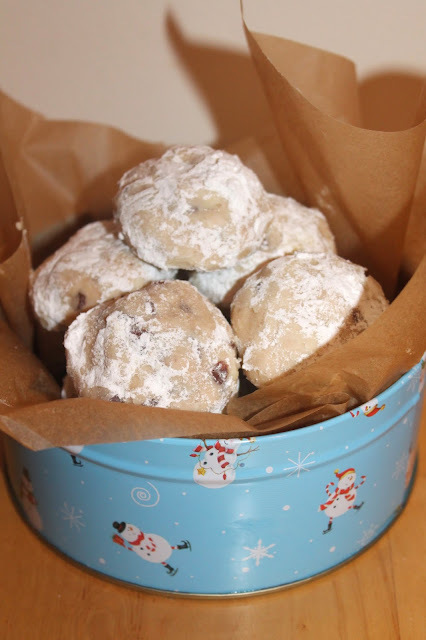 These delicate and delicious snowball cookies are my slight adaptation of my Great-grandmother's Mexican Wedding Cakes. The only thing I really changed here was swapping mini-chocolate chips in for the walnuts. This is mainly because I already made her thumbprints (walnuts) and brown butter pecan cookies, so I felt that we didn't really need another nut-based cookie. But another cookie with chocolate is always welcome! I must say that I think they turned out great and I may be making this version for years to come. This recipe will make about 2-1/2 dozen cookies. I'm guessing that most people are cookied-out at this point, but pin these for next year or maybe make them for a New Year's treat. I wish all of you very Happy Holidays! It's Christmas week and Week 8 of 12 Weeks of Winter Squash! This week I'm sharing a recipe that is lovely for a holiday dinner starter. It's made with a beautiful blue heirloom squash called "sweet meat" and it lives up to its name. This squash is sweet, dense, and meaty and the flesh is a beautiful bright orange - you just know this sucker is going to fill you up with vitamins. My father-in-law grew it in his huge garden this year, so we received a few of them. I had never seen these squash before so as a HUGE winter squash lover, I was very excited to try a new kind! Look at how pretty it is! 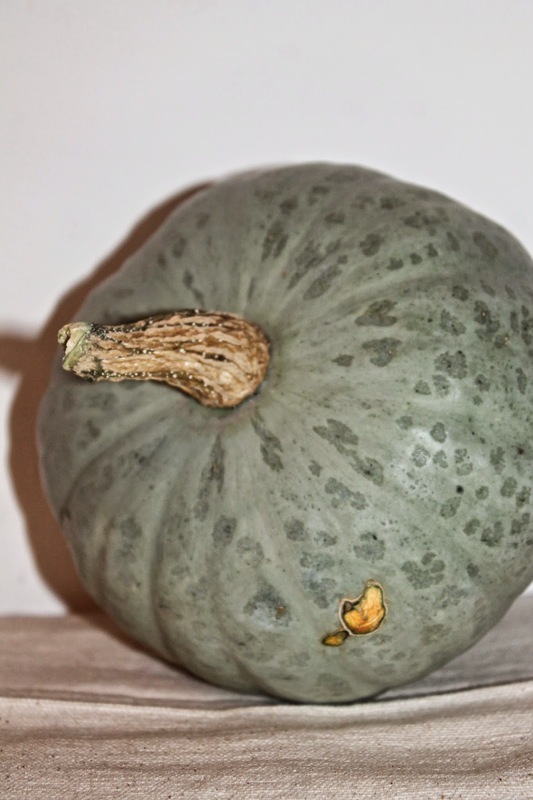 Of course, if you can't find your very own sweet meat squash, you can substitute a blue hubbard, kabocha, or red kuri squash as they are somewhat similar in texture and sweetness. You can also grow you own sweet meats next year! They make beautiful decorations, too! This soup will serve four as a side or starter. 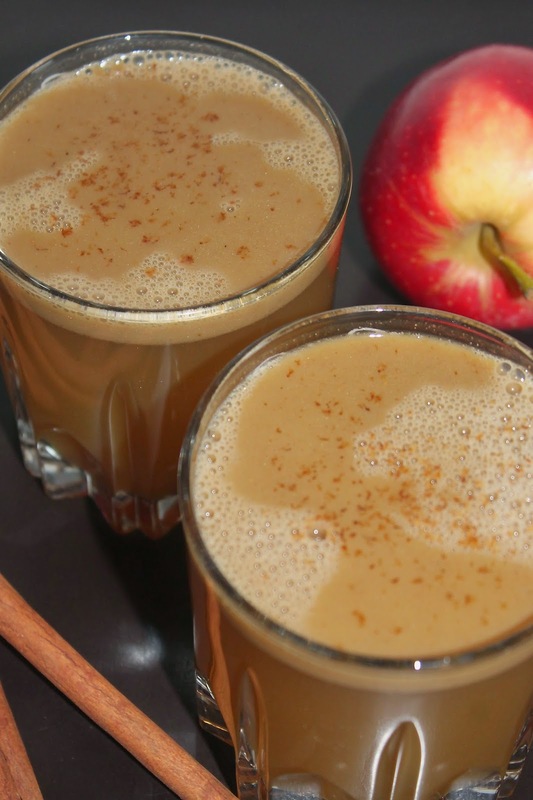 It's filled with other holiday flavors like chestnuts, apple, cinnamon, ginger, and nutmeg. Sugared cranberries are something I've been wanting to make for a while now because they just look so pretty and festive. Recently, we had a birthday dinner for my mom and I was in charge of the dessert. 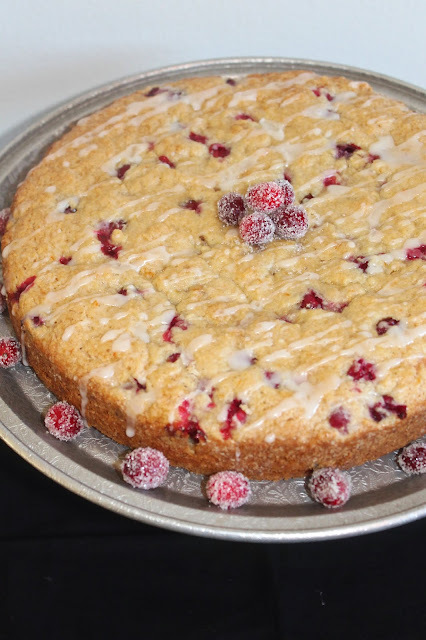 She requested a cranberry cake and this gave me the opportunity to make sugared cranberries to decorate this cake studded with fresh cranberries and orange zest. My mom doesn't like frosting, so I went with a very light glaze made with fresh orange juice - or you could top each slice with some freshly whipped cream and the sugared cranberries. Everyone enjoyed the cake and my husband really enjoyed the sugared cranberries and was eating them like candy! This cake was adapted from this recipe that I've had marked for a while now. I'm really glad I gave this cake a try. It was only lightly sweet, but sweet enough, with punches of tartness from the fresh cranberries. I really do love fresh cranberries and do not use them nearly enough in my cooking. I'm changing that for sure. If you are looking for an elegant holiday dessert, look no further! It's a bit of a process, but the results are worth it. I'll definitely be making sugared cranberries more often now! Butter pecan is taken to the next level in these cookies by taking the regular ol' butter and making it nutty and golden brown butter! 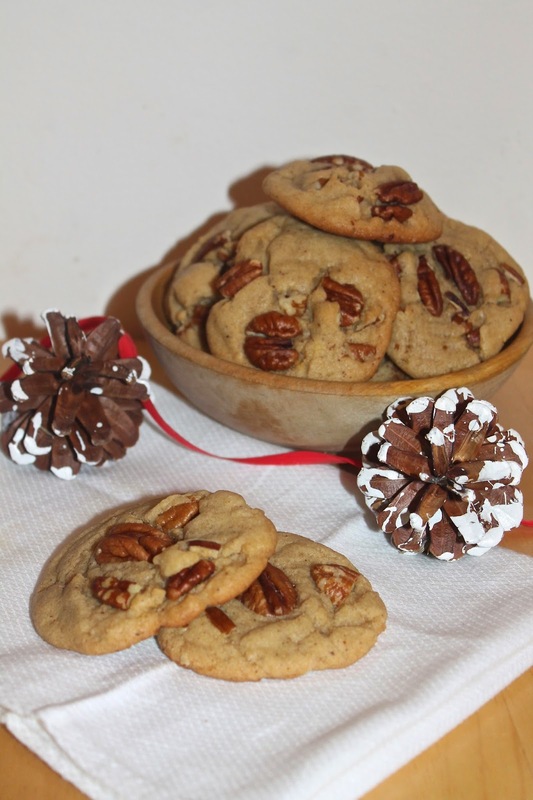 Yes, that's right - these cookies are full of rich nuttiness and are a perfect cookie for the holidays or anytime of the year. These cookies were adapted from a chocolate chip cookie recipe that uses melted butter - I just swapped the chocolate for pecans and cooked the butter longer. The result were perfect - chewy, nutty, rich, and delicious. Plus the smell was amazing. I'm really glad I decided to give this idea a try! I always try to make at least one or two new cookies each Christmas, along with the standbys that we have pretty much every year like my Great-grandmother's thumbprint cookies and these rosemary shortbread Christmas trees. What are your favorite cookies you make each year? This recipe will make about 3 dozen cookies. I have a feeling that I may need to make another batch of these before Christmas so we have more to share - they are going fast! It's Week 7 of 12 Weeks of Winter Squash and I can't believe it's taken me this long to feature one of my most favorite winter squash - delicata! I love delicata squash because not only are they delicious, but they are so pretty and very quick cooking. 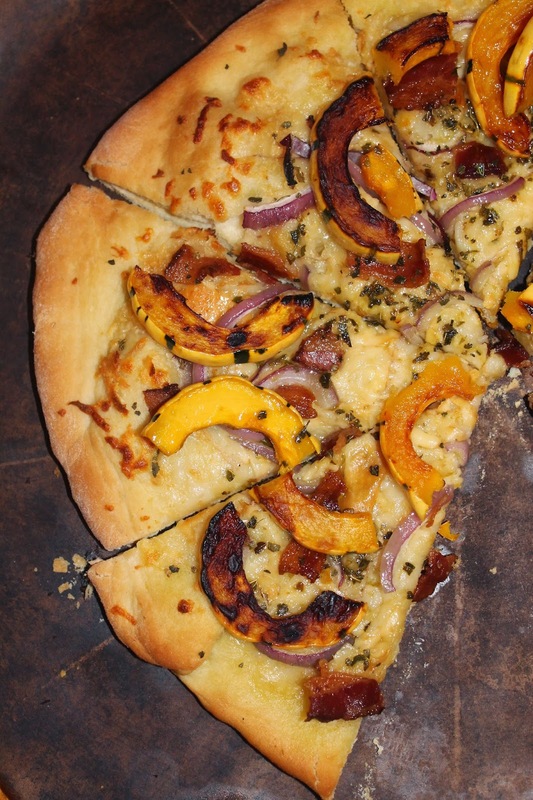 I've been thinking about putting winter squash on a pizza for a while now and finally decided that delicata would be the winner. 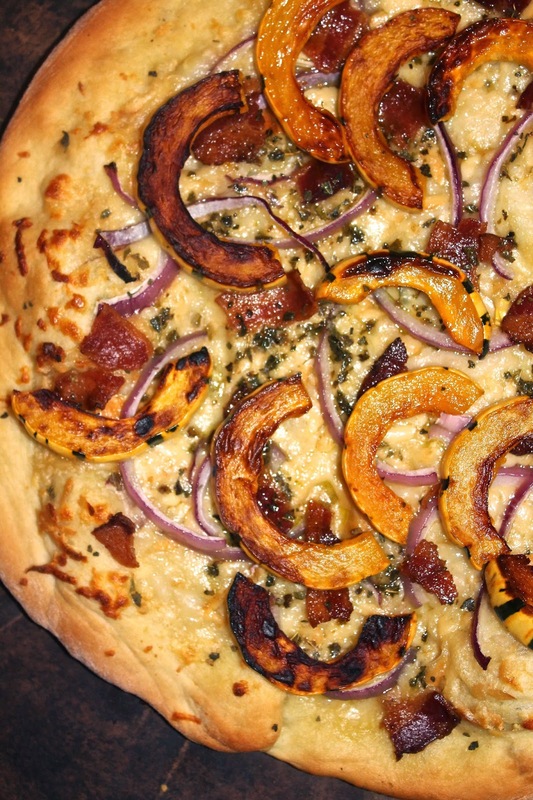 The sweet, creamy squash pairs so nicely with the salty, smoky, and crispy bacon. To up the smoky deliciousness of the pizza, I used smoked mozzarella. For my pizza crust, I almost always use this recipe (or this one if I'm in a pinch for time). For this pizza I used the first crust which I find usually makes two pizzas that are about 10-11 inches in diameter (this depends on how much flour your dough takes that day given the humidity, etc.) This recipe is for two pizzas about that size. We make pizzas probably about once a week or every two weeks. We love pizza and now that I've discovered these simple dough recipes, it's so simple to make at home. Plus, you can try out all sorts of toppings and combinations! How can it be that this is only the second drink containing alcohol that I've shared on this blog?!? I mean, really? I guess it's mainly because my husband and I are generally boring drinkers - beer, whiskey on the rocks, or the occasional glass of wine. We don't really make a lot of mixed drinks except when he whips up a martini every now and again... However, I think it's time to change that. I've been wanting to try a buttered rum or hot toddy or some other warm and festive drink for a while now. 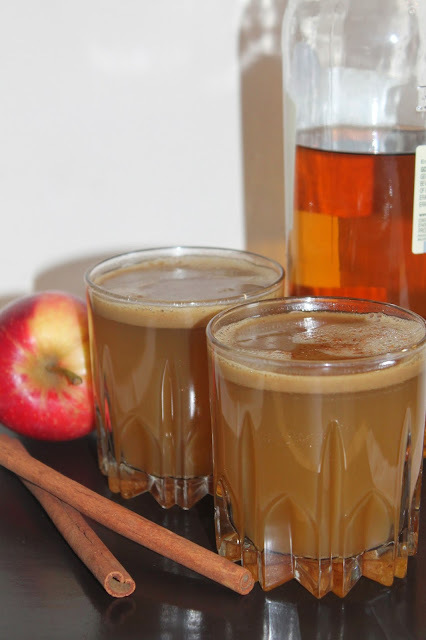 This drink is a combination of hot buttered rum and hot spiced apple cider and it's delicious - so perfect for the holidays or any cold evening. A lot of the recipes I read for buttered rum were loaded with butter and brown sugar! My version is lighter on both of those and will make two drinks. The addition of butter is just enough to add a touch of creaminess and froth to the drink. I'm sharing this cocktail recipe today in celebration of 5 years of this blog! I never imagined I'd still be blogging about recipes and, even crazier, that I don't see an end in sight - I still have so many recipes I want to make and share! I'm thrilled to have "met" so many fantastic, creative, and inspiring people through this medium. I truly thank all of you who stop by and read, leave comments, share and talk on social media, etc. So this drink is a toast to all of you! Cheers! 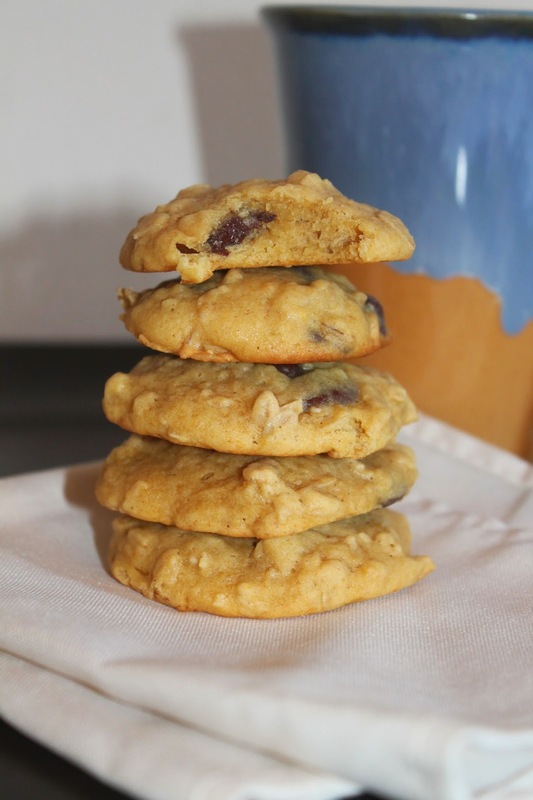 These are not very Christmasy cookies, but they are an appropriate cookie for Week 6 of 12 Weeks of Winter Squash! I had a small butternut squash that needed to be used up pretty quickly. I had previously seen this recipe which I had bookmarked as an idea (with thousands of others, of course - food blogger problems), so I figured it it would be a good time to make some squash-infused oatmeal cookies. There's something about butternut squash that makes baked goods taste and smell really squashy/pumpkin flavored - more so than pumpkin puree, I find. I may start using butternut squash in all my pumpkin recipes! To make butternut squash puree, I simply baked a halved and seeded quash in a 375 degree oven until I can pierce it with a fork (time will depend on the size of your squash). Then I let it cool slightly and scrape the flesh into a food processor and puree. You can often find butternut squash puree canned in the grocery store as well. So while these cookies don't scream Christmas, they are a nice cookie for all winter long, especially if you find yourself with some extra butternut squash. Save these cookies for a cold January or February weekend when you want to snuggle up under a blanket with a plate of cookies and a hot cup of tea. You will be glad you did! This recipe will make about 2-1/2 dozen cookies. I've been on a bit of a breakfast recipe kick lately when it comes to winter squash. 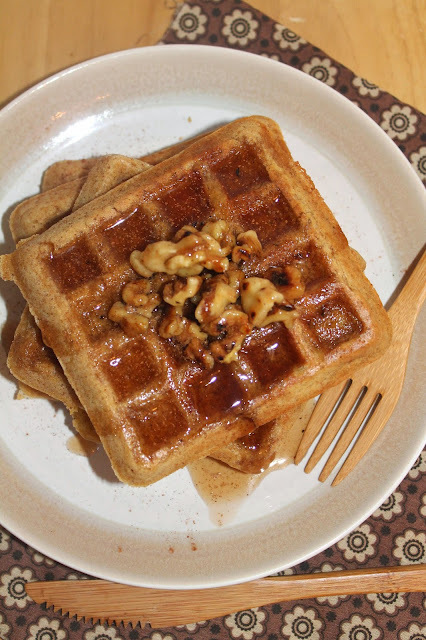 This time, it's waffles - waffles infused with a mashed acorn squash, cinnamon, and nutmeg, and topped with more cinnamon, sticky toasted walnuts, and warm maple syrup. Yes, this is my kind of weekend breakfast. I wanted to use acorn squash for a couple of reasons. The first is that we had some really small ones, so I was hoping that i would be able to use it all in the recipe and not have any leftover squash remains. The second is that acorn squash is not very sweet when compared to many winter squashes and I like this in a breakfast that I'm going to douse in maple syrup. I'm not a fan of sweet overload, especially in the morning. 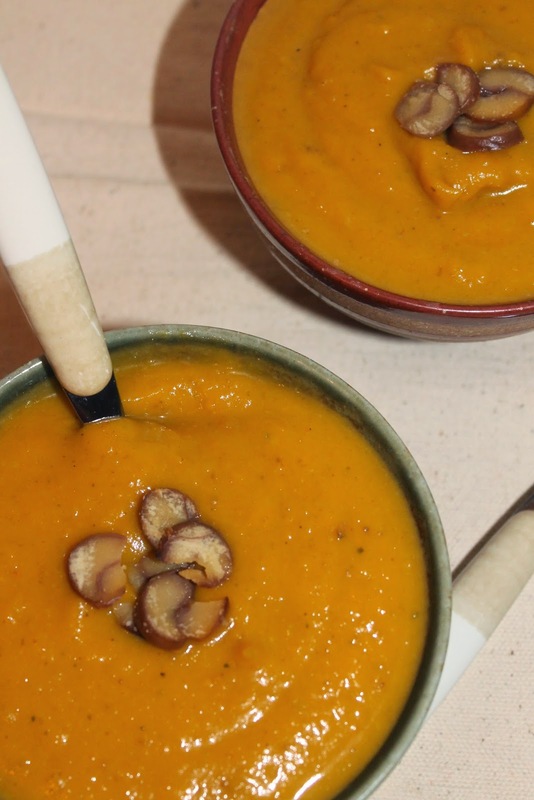 This recipe is my contribution to Week 5 of 12 Weeks of Winter Squash. You can see other recipes at the bottom of the post and there's still lots of time to join in. I've still got a lot of winter squash in my basement to get me through the winter and the next 7 weeks of recipes. These waffles were adapted from this recipe. It made 9 waffles for me, though this will depend on the size and shape of your waffle iron. Photo courtesy of OSOhome - I love the apple! Today I'm doing a post that's a bit different (i.e., not a recipe), but I hope you will enjoy it! I was lucky enough to meet Monica of OSOhome at the World on Your Plate 11th Annual Conference on Food & Sustainable Living in October where I sat in on her Entrepreneurship workshop. I took this workshop on a hunch that I might pick up some good tips and ideas for growing and marketing my blog. Little did I know that I would also meet someone who owns a small business that creates beautiful and eco-friendly wood cutting boards and is also pretty local to me (just a short drive over the bridge)! 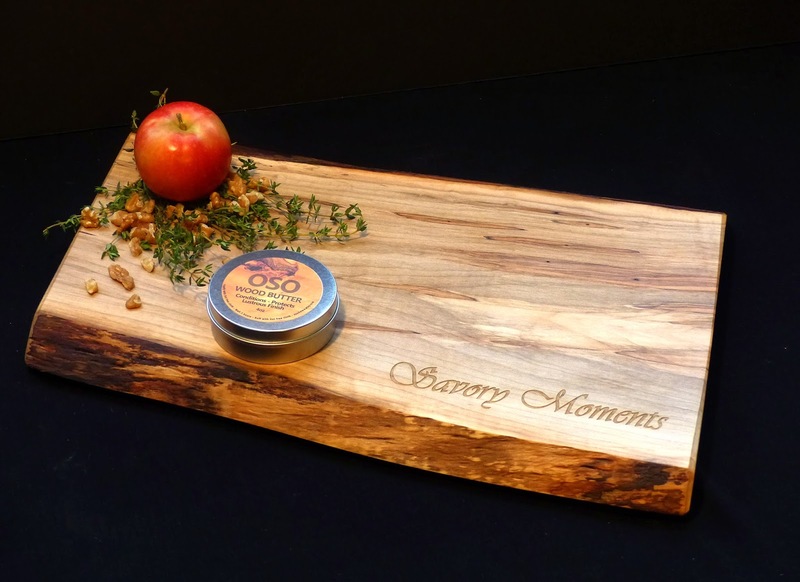 As you all know, I'm very passionate about local foods, supporting local farmers and food artisans, and also the environment, so when they asked me to review their cutting boards - it was a no-brainer! I am picky about the companies I support and promote on my blog, but after meeting Monica, learning about their company, and receiving the product, I'm a full supporter of their work! My cutting board after I opened the box. The wrapping and presentation was very pretty.